I want that point on the circumference of the outer circle to join horizontally to the tangent of the inner circle - which I guess would just be the top of it. And then I want it to loop round and rejoin; I know how to cut this out once created. What's the best way to create this where everything line's up orgasmically? I'm not very experienced with Photoshop / vector work; should I be using the pen tool or shape tools? I'm using Photoshop - I've no money. Tap CTRL+R (or ⌘+R on a mac), this will show you ruler guides on the top and left of your image. From these rules you can drag out a guideline, and use that for snapping and reference to get perfect lineups. You'll need to first select the smaller circle object, then drag down from the top ruler, and the guide should be able to be snapped to the top of the circle. Repeat this action for the bottom of the small circle, so you have two "tramlines" as guides running through the middle of your image. 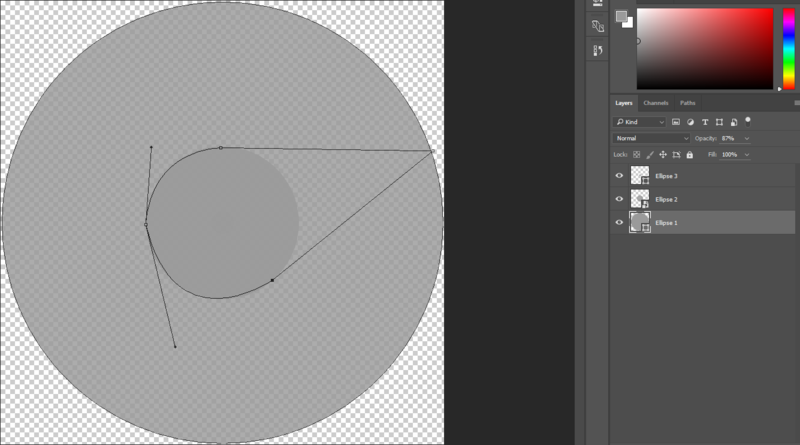 Now select the bigger circle, and drag a guideline out from the left rule, and drop it on the point of the circle that's where the horizontal guideline meets. Now you have the points you need available for snapping to guidelines. This question has popped on the surface by the system, but it was interesting. I did not find any method to do it in Photoshop except drafting something coarse. CAD-like exact snaps are not available. By setting quides and using high zoom one can in achieve something which is accurate enough when used in rasterized image. No Illustrator is a problem, but as suggested, there are others. Let's try Inkscape altough it also lacks some important snaps. Some measures must be copied and pasted as numbers or some extra snappable lines must be drawn. We have 2 circles Green and Blue with a common centerpoint. Have all snap to point options ON. Draw the magenta tangent to the Green circle. Hold Control key to get perfectly horizontal line. Snap to the top quadrant point of the blue circle quarantees right placement of the left end snap to path quarantees the right end. Select the Blue circle. Duplicate it by pressing Ctrl+D. 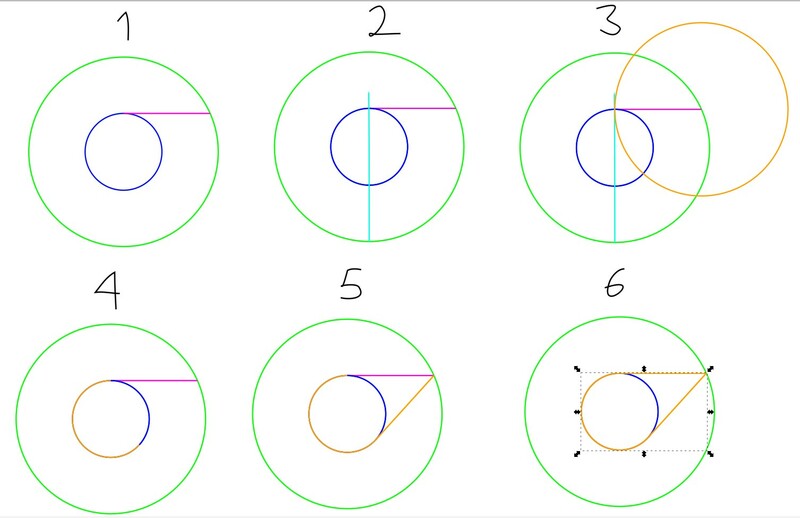 Draw a vertical line (cyan) through the centerpoints of the circles. Start from the lowest quadrant point of the green circle. Be sure that the orange circle is on the top. Select the orange circle and one of the blue circles (duplicated!). Goto Path > Cut path. The orange circle vanishes and one of the blue circles gets divided. Delete the rightmost part and color the left part (=orange). Delete the cyan line. Not the answer you're looking for? Browse other questions tagged adobe-photoshop adobe-illustrator vector shapes or ask your own question.